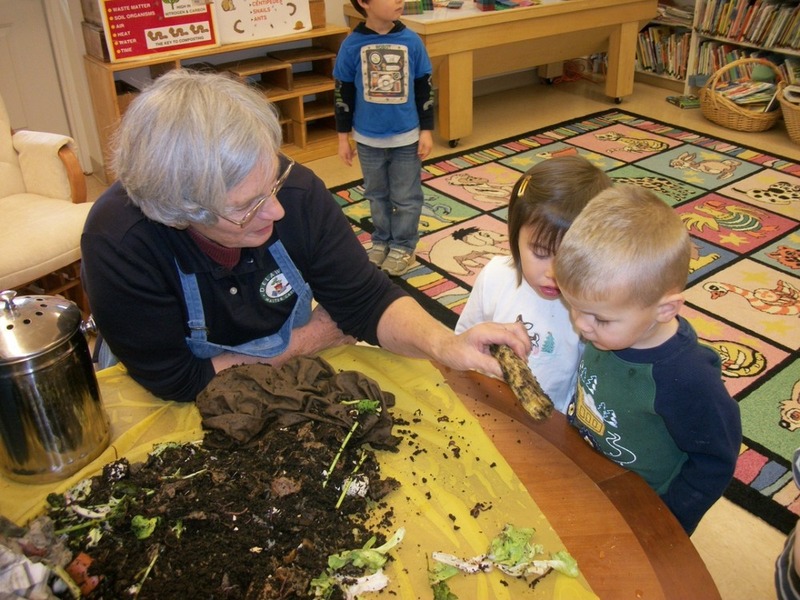 The Ladybugs spent April and May learning about fish, bugs, and going green. We read fiction and nonfiction books. They learned how flounder start out like other fish, but gradually one eye moves to the other side, the fish flattens and is camouflaged on the bottom of the sea. Our bug study taught us that insects start as eggs, often shed their skin as they grow, and some have bright colors to deter predators. 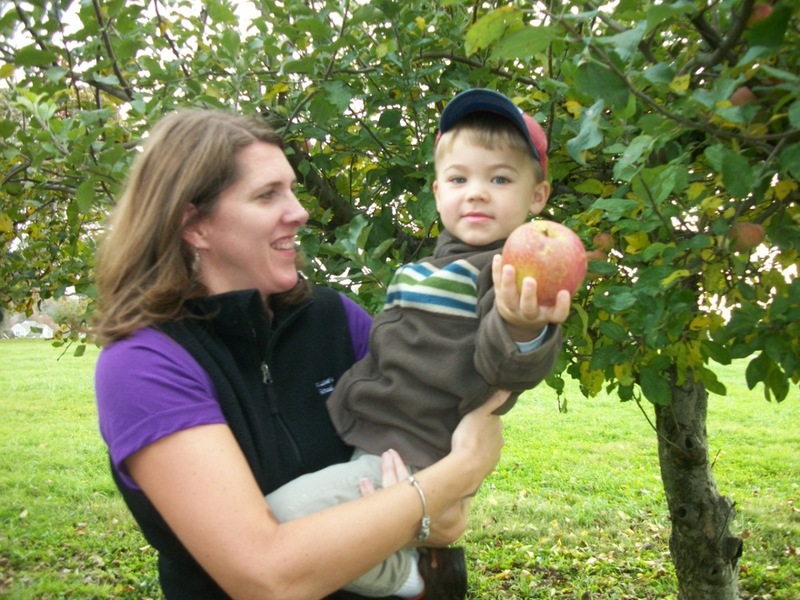 We learned simple things that we can do to help our world – turn off lights, conserve water, use reusable bags, etc. 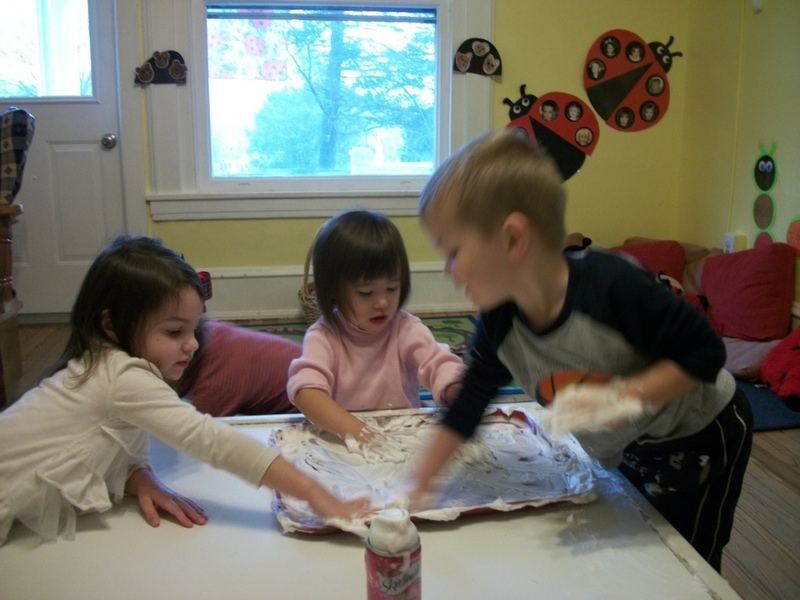 We played in the water table and with shaving cream. Our art projects have included finger painting, sponge painting, drawing with oil pastels, and painting with dabbers, gadgets, and symmetry butterflies. The Annual Fairville Art Show will be on May 30 from 4:30PM until 6:30PM (rain date May 31). It is a very special event. Invite grandparents, if they live close. 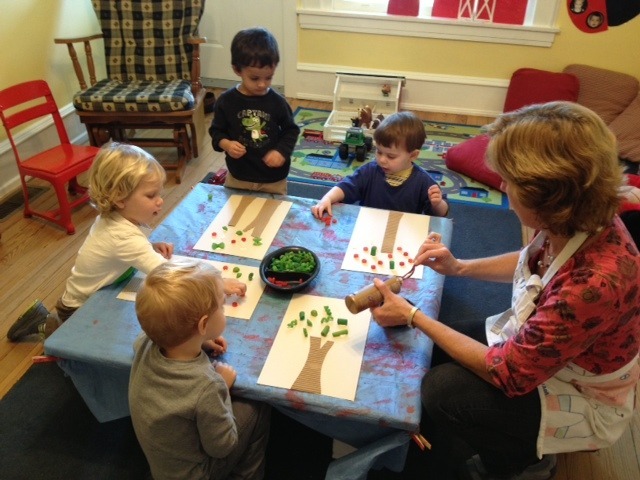 We will spend the last two weeks with our favorite books, art projects, songs, and finger plays. Listen for the turkey and snowman songs. We’ll be going on a bear hunt again! Thank you to all of the volunteers who helped with the Fun Fair and the classroom. Our last day of class is May 24. It has been a pleasure teaching your children. The ladybugs enjoyed the stories and beautiful illustrations of Eric Carle. When we read the book about the foolish tortoise, we etched shell designs on foam trays and printed them to make our own tortoises. We made adorable hungry caterpillars from paper circles. We sorted and counted plastic bugs after reading The Very Lonely Firefly. The rain song was fun after reading Little Cloud. Our art projects included finger painting, drawing with oil pastels, and circle prints. We also drew with glue then sprinkled our papers with salt. When the glue dried, we painted the salt with watercolors. The children were fascinated watching the paint spread through the lines of salt. Judy taught a lesson on seeds. The Ladybugs ate seeds for snack - grape tomatoes, cucumber slices, watermelon, and sesame poppy seed crackers. We compared different seeds and planted some of them. When the snow stops, we will plant some seeds in our Fairville garden. We hosted another Canine Partners for Life puppy in training. The children enjoyed Beth, an eleven week old yellow lab. The chicks were a highlight in March. Although they decided to hatch before we got to school on Monday morning, we were still captivated just watching them. 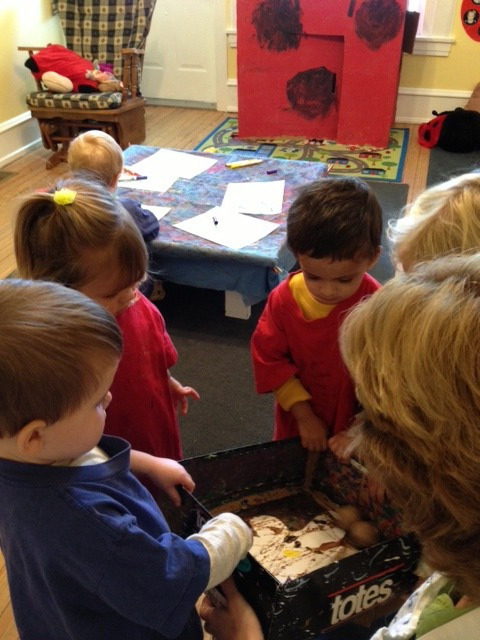 We brought chicks to our room and observed them closely before painting chick pictures. We are planning to share our paintings at Meeting for Sharing. We read many books about chickens and one book about other animals that come from eggs. We rolled a ball and an egg on the table. 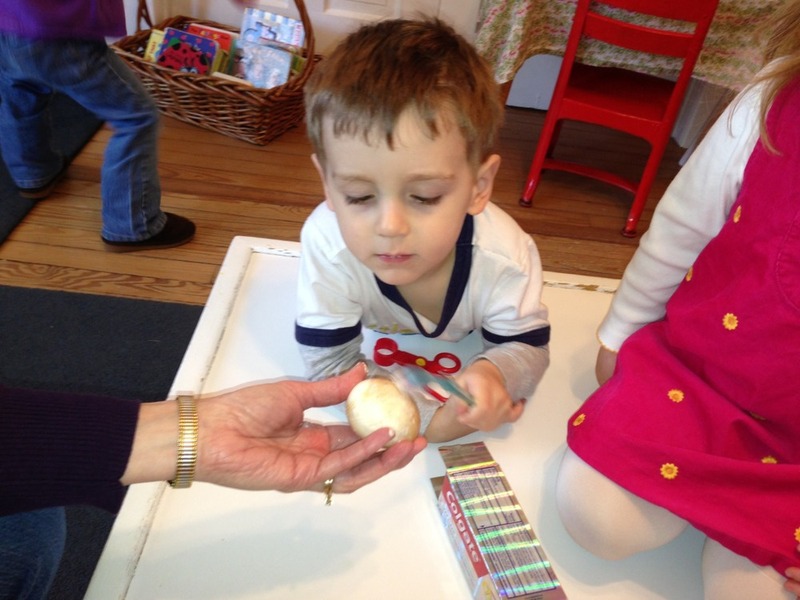 We saw that the ball rolls in a straight line, but the egg was designed so as not to roll out of the nest. We sang some farm and chick songs and the Tuesday/ Thursday class danced the chicken dance. The Ladybugs have been busy community helpers for the past few weeks. 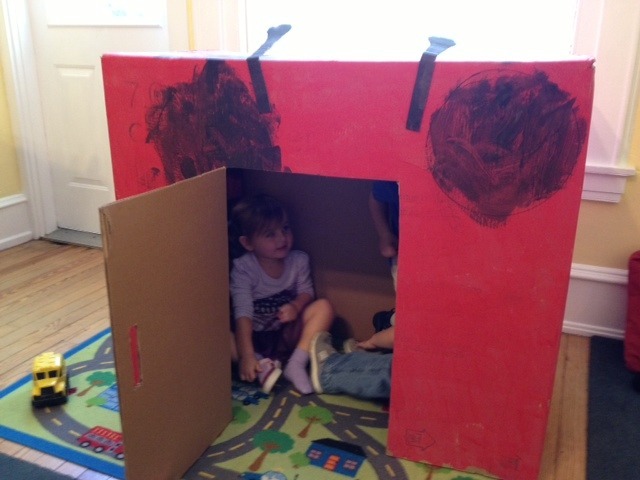 They were doctors at Ladybug General Hospital and firefighters in the big red fire truck in our classroom. They looked like a pathetic bunch as patients all wrapped in bandages. They were also police officers and dentists (cleaning "dinosaur teeth" stained with cola). It was fun to see the difference a toothbrush and some toothpaste made. 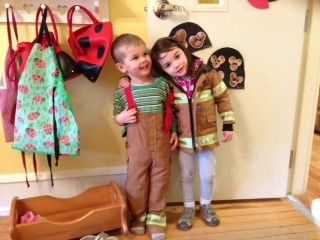 We sang songs about fire fighters, fire trucks, and police officers. We had a shape search on the fire truck. It was loaded with shapes. 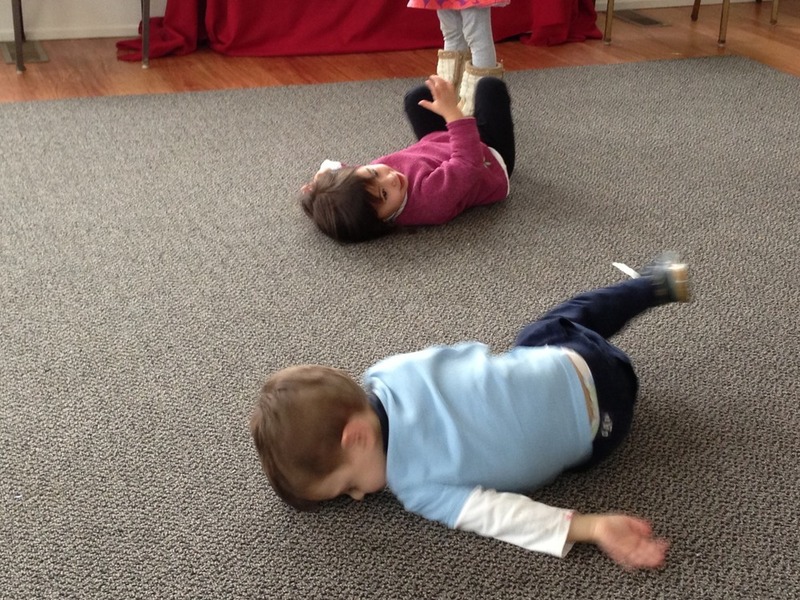 We also practice "stop, drop, and roll" as part of our fire safety lesson. 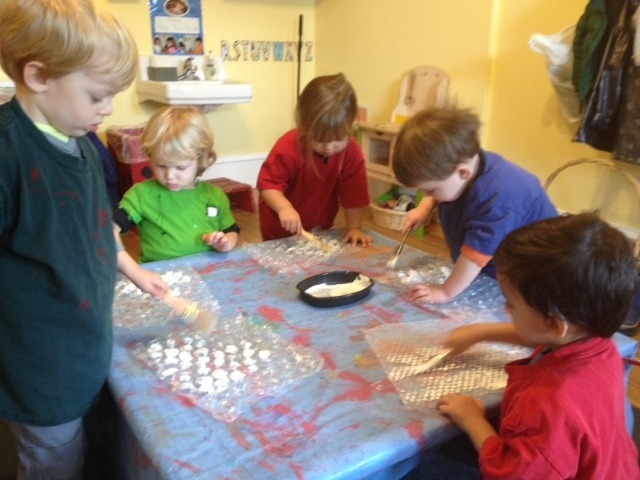 Our art projects included painting with toothbrushes, gadgets, bubble wrap, and glue bottles. We also made collages and drew with markers. We are collecting artwork for the art show; some of the artwork will be saved in the portfolios and returned at the end of the year. 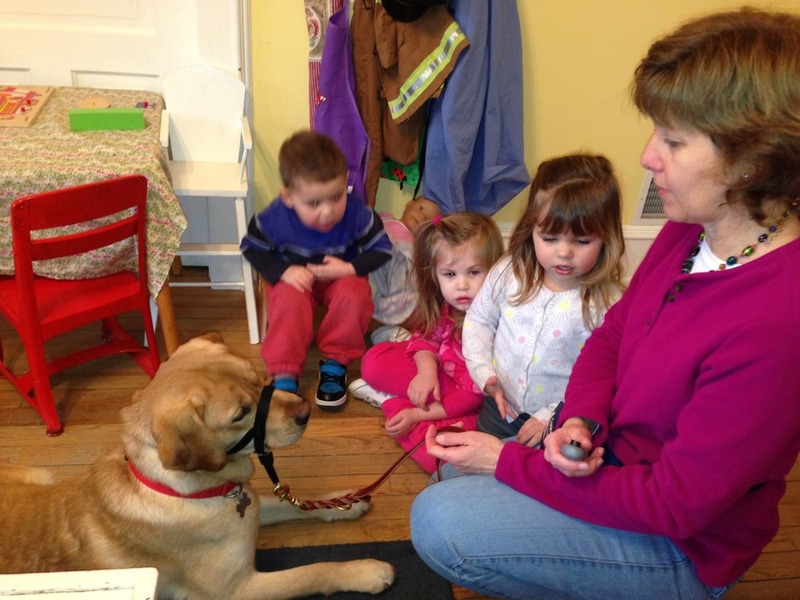 The Ladybugs provided preschool experience to Patrick, the nine month old yellow lab for Canine Partners for Life. The puppy even wore pajamas on Thursday. Our next theme is Eric Carle books. He has written many great books and his illustrations are beautiful! The Ladybugs have spent January learning about birds. We read books and sang about penguins. You should have seen us waddle around the room as we sang. We talked about the fact that penguins cannot fly, but they swim. 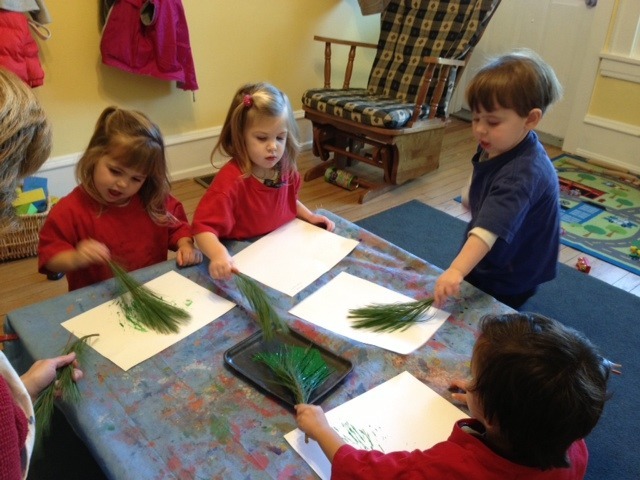 To relate to the penguins in cold climates, we painted with colored ice. We read about owls and talked about their nocturnal hunting. 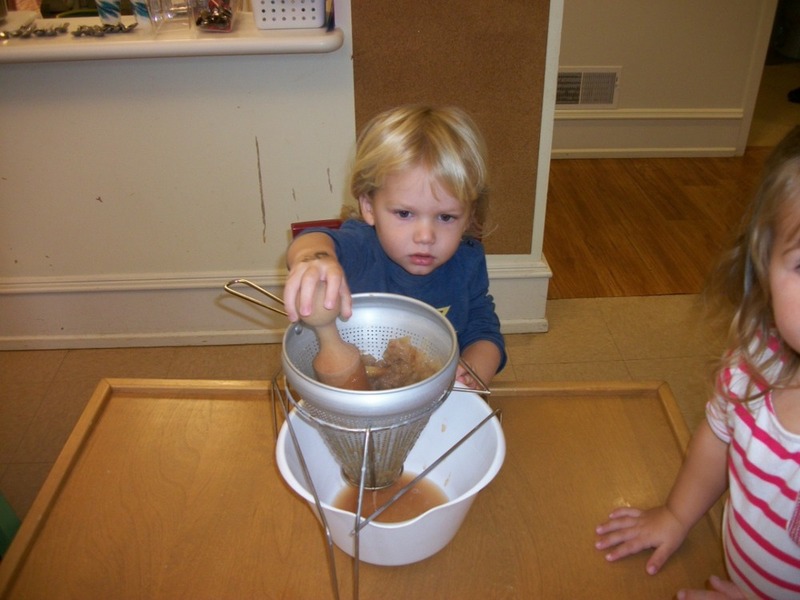 We sorted feathers in the sensory table and painted with feathers. 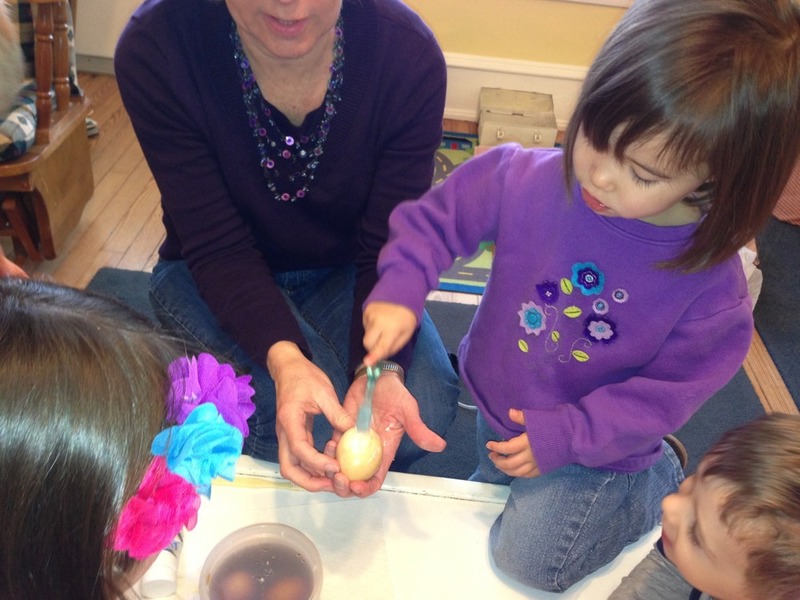 This week we read more bird books including one about other animals that hatch from eggs. 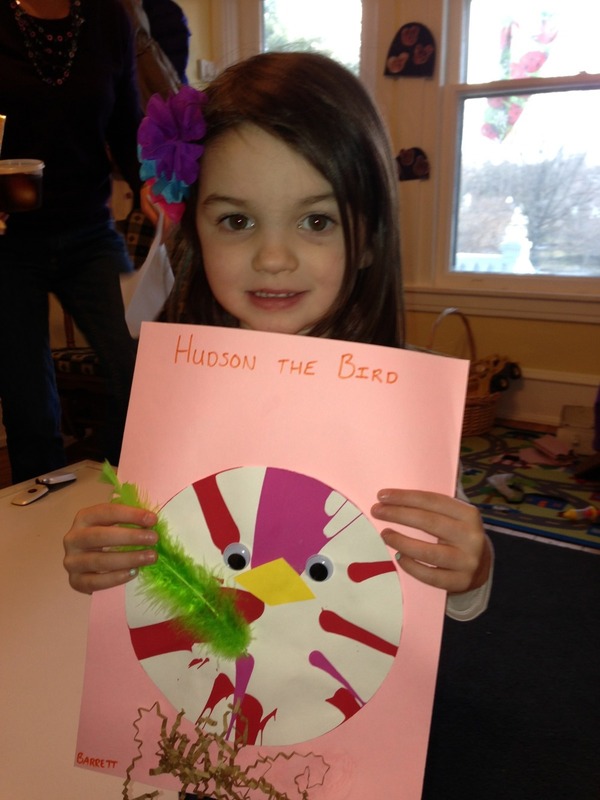 We painted in the salad spinner and turned our artwork into little birds. 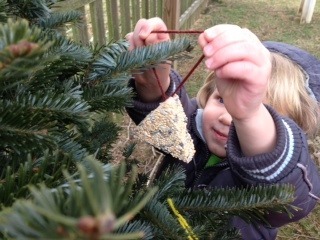 We also mixed and shaped birdseed treats to share with our feathered friends during this cold weather. Some of the treats were hung in the school yard. One will be sent home with each child for the birds in their yards. Thank you for sending warm winter gear for your children. We did stay in this week while the temperatures were extreme, but will be going out again soon. We enjoyed our brief visit with Magic, the Canine Partners for Life 8 week old service dog in training. The exposure to the children was great for the puppy (and the children liked him, too). Congratulations to the Scheibe Family (Christian, T/TH) and welcome to baby Henry! 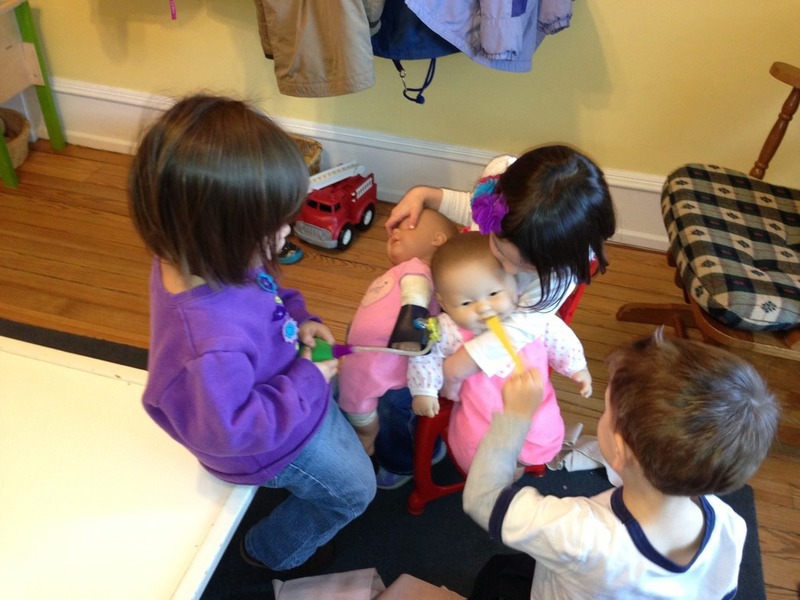 Our next unit will be Community Helpers. We will start with doctors and dentists, next week. 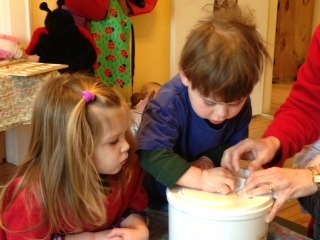 The theme in the Ladybug class in December was sharing. We read some great books including The Hat , The Mitten, Dream Snow, The Friendly Beasts, and the favorite, Should I Share My Ice Cream? . We painted with pine branches, shower puffs, cookie cutters, and glitter. When we read about the gingerbread man, we did a gingerbread man color poem on the feltboard. 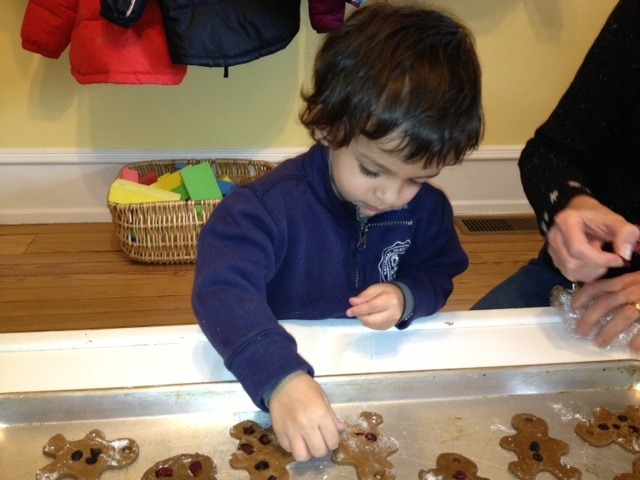 We also rolled and decorated gingerbread cookies. Maybe one made it to your tree? We played with shaving cream. It is fun to make letters and designs in the midst of the foamy mess. The children had fun singing the snowman song. The MWF class shared it at Meeting. 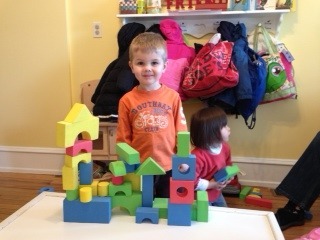 We have also had fun with color, shape, and opposites activities. We hope you are having a relaxing break. Happy New Year! 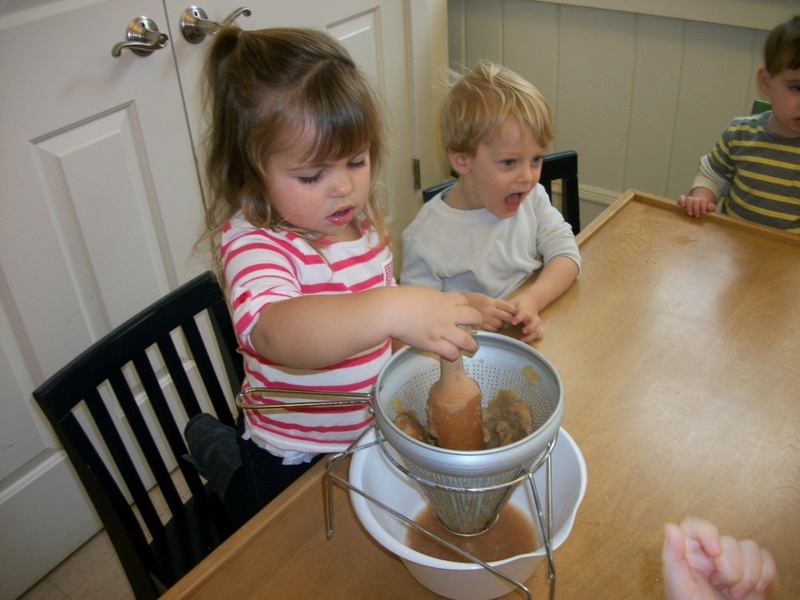 Children explore and learn through sensory experiences. 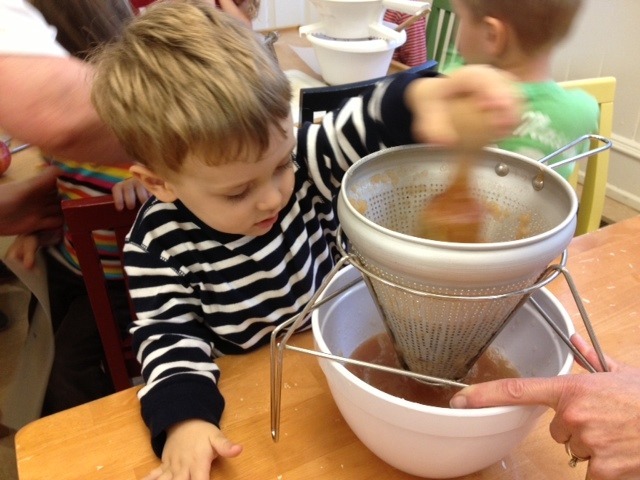 The Ladybugs enjoyed the rich sensory experiences of our recent farm unit. 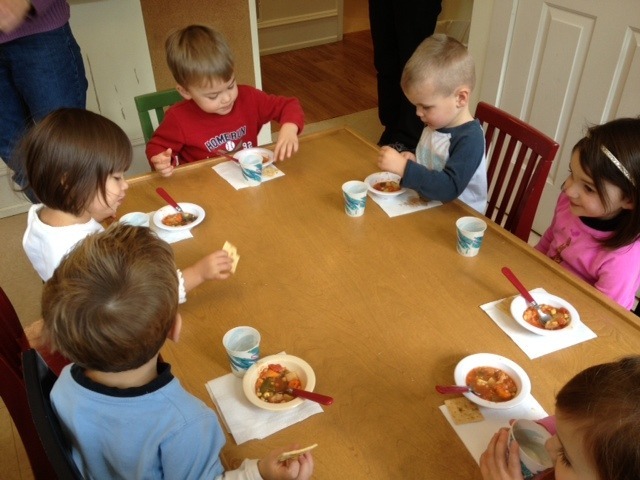 We smelled and tasted our friendship vegetable soup, fresh warm applesauce, crisp roasted pumpkin seeds, and Little Red Hen rolls. We smelled the smoke on the beekeeper's head gear, as we tried it on, and also smelled the leather of a worn saddle we sat on. 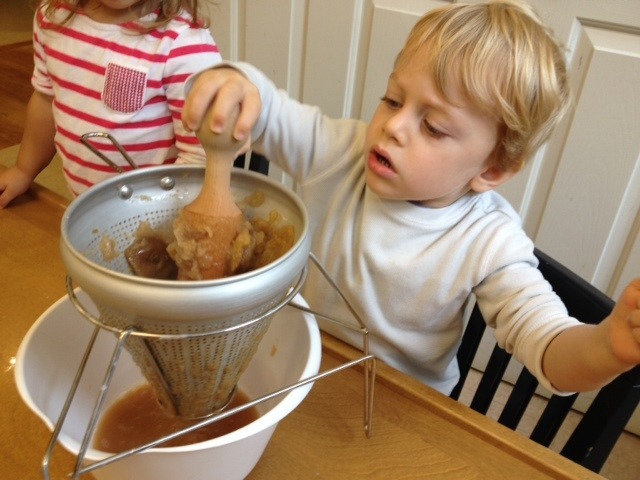 We felt many things including, the pulp of our Jack-O-Lantern, corn and beans in the sensory table, the wooly sheep, the wiggly worms of the compost lesson, the bubble wrap that we painted, crinkled newspaper that we stuffed our scarecrows with, and the vegetables that we chopped for our soup. 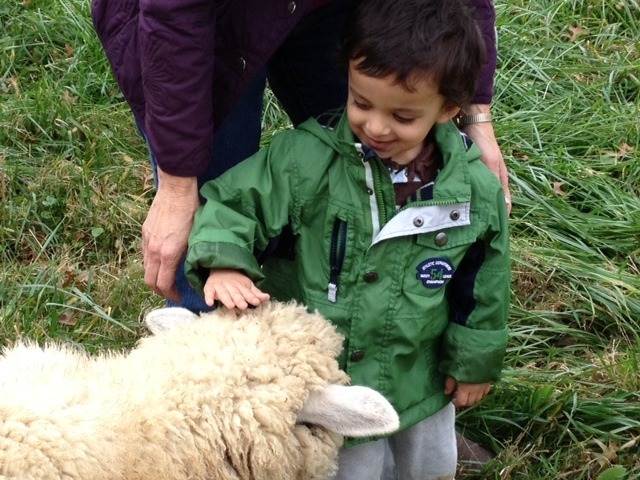 We listened to the honey bees hum in their hive ( demo by Maile's dad ), the sheep calling in the pasture, happy children at play, and books and songs about farms. 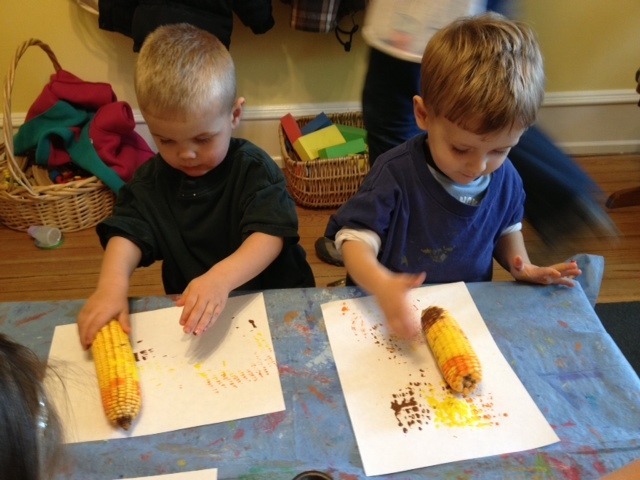 We observed the tracks that the painted wheels of trucks made on paper, the corn cob sprouting new plants, the star in the middle of the apples, and the veins that print from painted leaves. We also did a neat science experiment where we put a stalk of celery in a cup of blue dye, then observed the color change in the celery's leaves the next school day. As Thanksgiving approaches, I would like to thank you for your generous donations of food for the food cupboard and coins for the Red Cross. I hope you have a wonderful holiday! The Ladybugs have started the farm unit with Sandy and the Bumblebees. 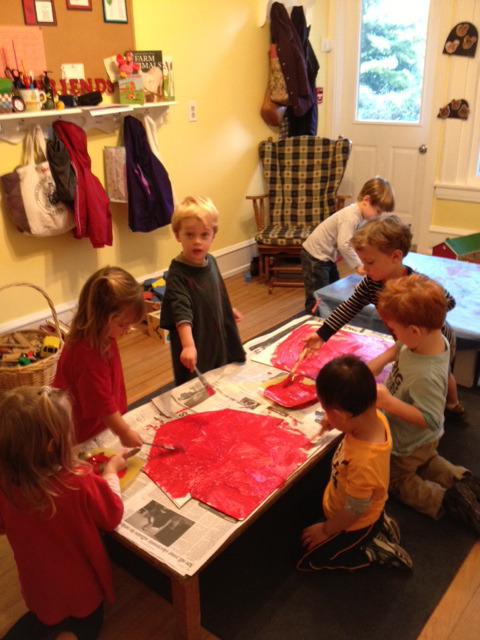 We read The Big Red Barn and painted big red barns together. 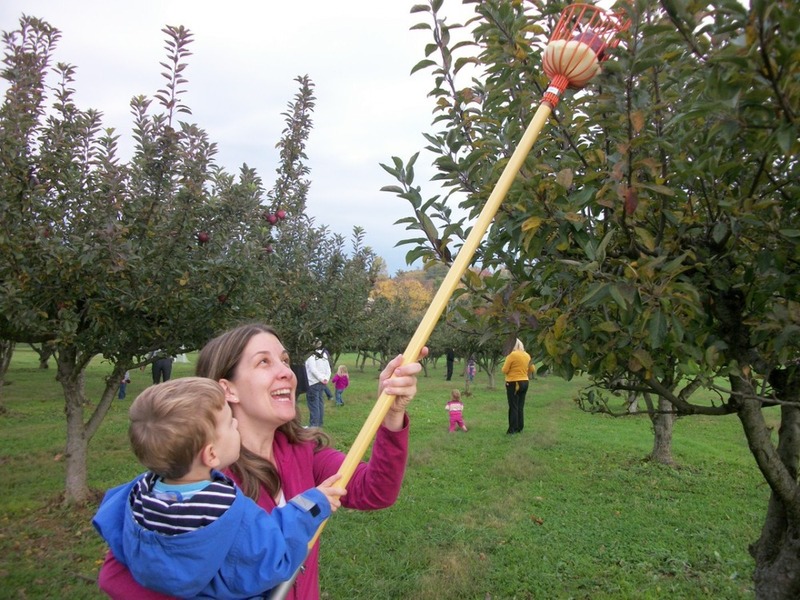 We also sang farm songs, played with puppets and picked apples together. Laurie brought a saddle to school. 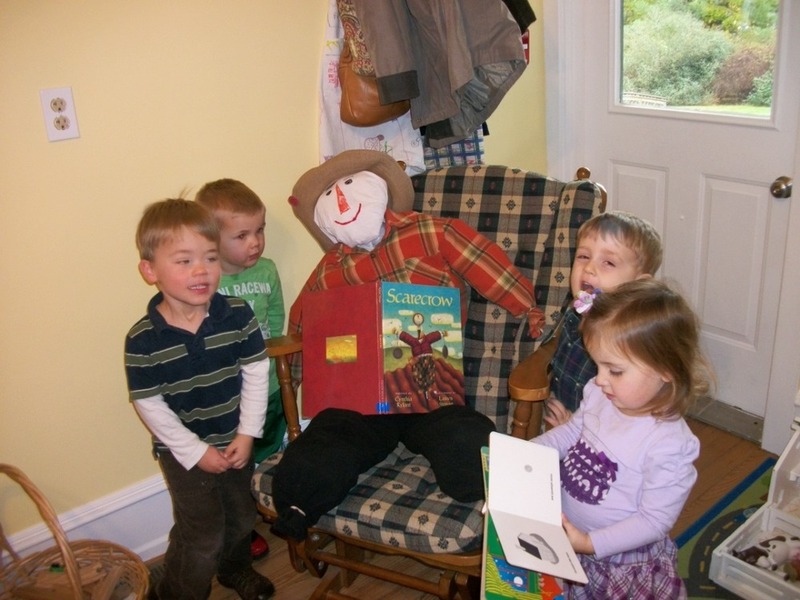 The children had fun riding the pillow- horse. 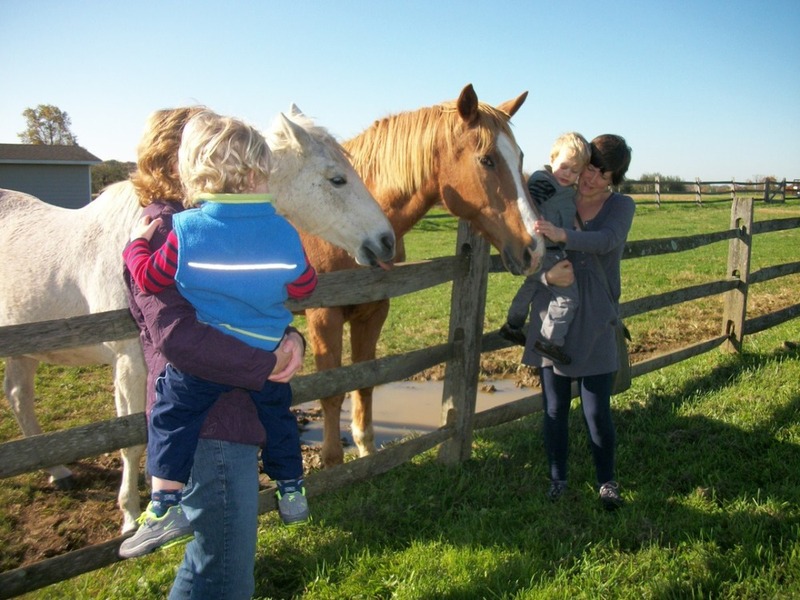 We fed apples to the real horses on the way back from the orchard.We have more fun joint activities planned. Last week we had a visit from the Longwood Fire Department. They gave some fire safety tips and showed us their brand new fire truck. We even climbed into the truck. Enjoy the photos. We spent September getting to know each other, the school and class routines. We read books about starting school and friendship. We have been attending Meeting for Worship since the first day of school. You are welcome to join us any morning at 9am. The children are already singing along. Painting is very popular. We have painted with golf balls, shower puffs, balloons, our fingers, and brushes. We made stepping stones for the Peace Garden and shared them at Meeting in the garden. The Ladybugs love to visit Oscar, the bunny. They also enjoy the new instruments in the Peace Garden. 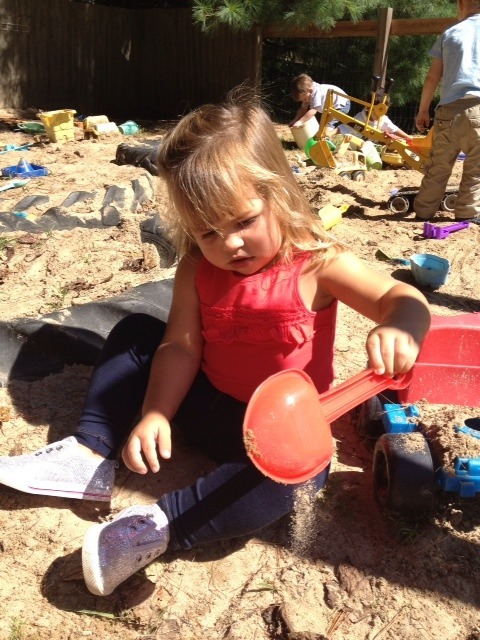 We have been exploring the outside play areas - the taxi, playhouse and sandbox are very popular. We have started our bear unit. We read bear books including Going on a Bear Hunt and sang the "Hokey Pokey" bear style (with fuzzy ears, paws and tail). We sorted and counted little bears. The Ladybugs received a very special gift from the Grasshoppers. 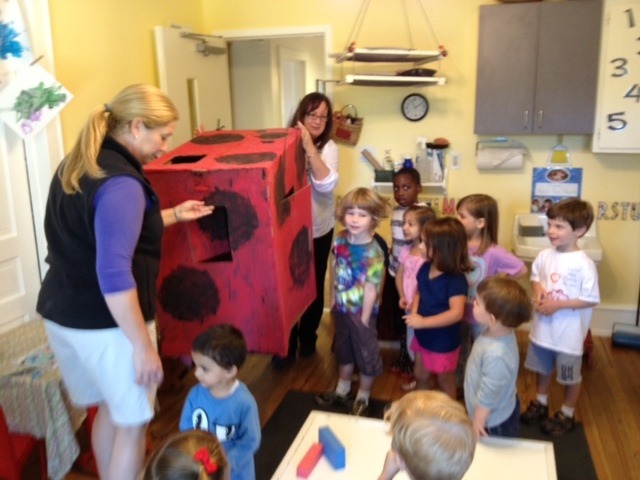 The Grasshoppers created a ladybug house complete with design details, including a skylight, "so the children will not be afraid in the dark". Liza and I like to peek in the skylight to check on them. 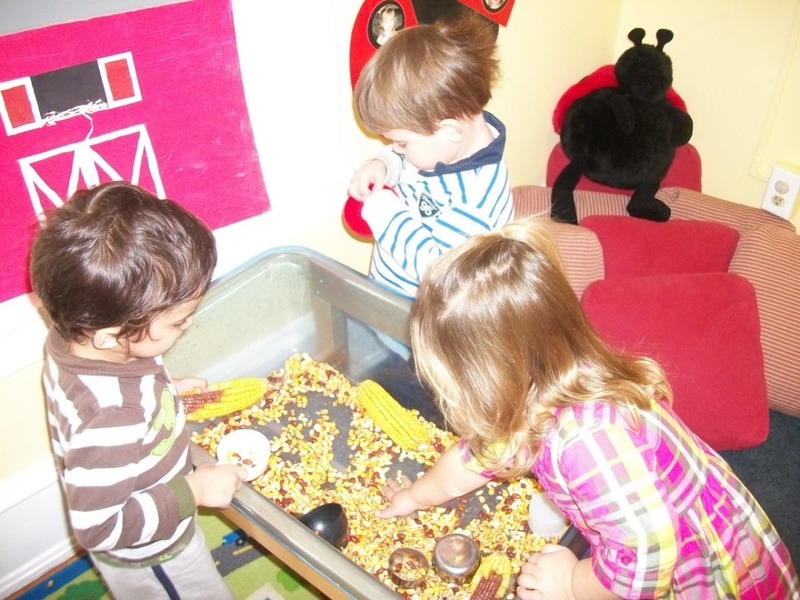 The Ladybugs have had so much fun in the house.